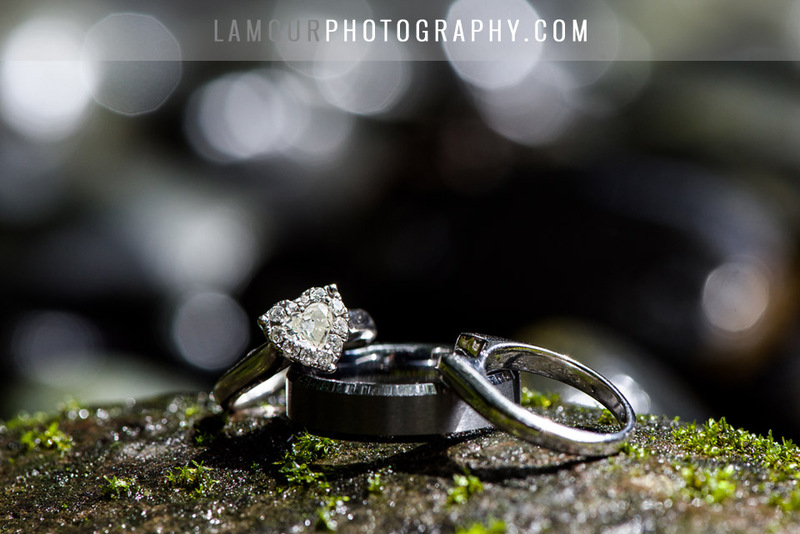 In honor of Valentine’s Day, we would like to share with you our very own personal photos from L’Amour Photography and Video owner and photographers, Eric and Wendy’s vow renewal. 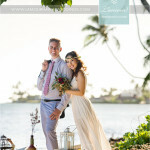 For this special day, we hired our team of photographers and videographers to capture our intimate ceremony at Bayer Estate on Oahu. 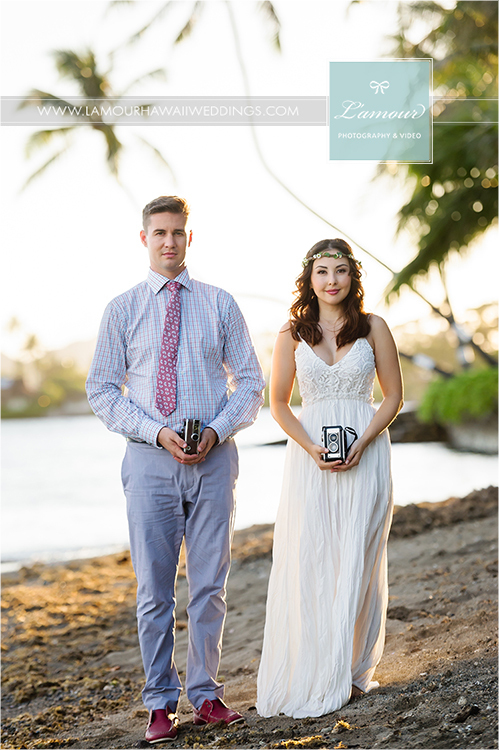 Some of our favorite Hawaii wedding vendors made this day everything we wanted it to be. 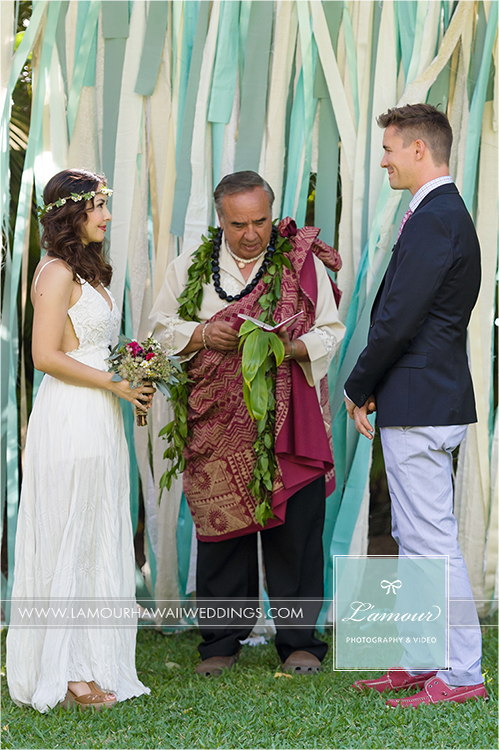 Makeup and hair was done by the very talented Heather Heen of Delish Makeup with our ceremony performed by Kahu Wendell Silva. 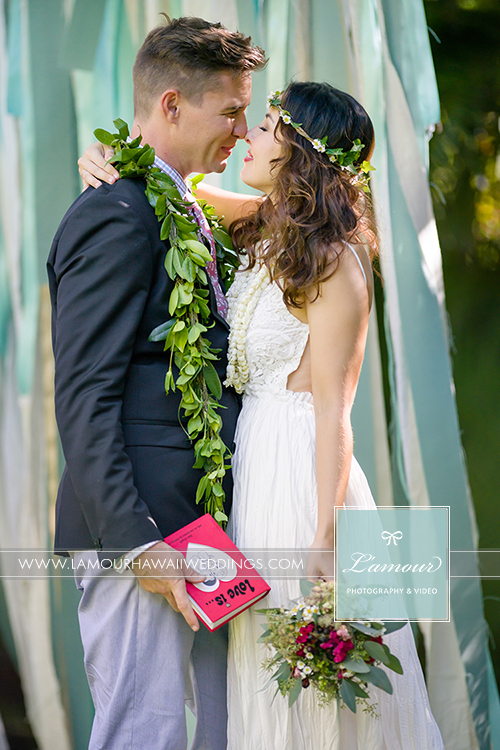 Wendy’s bouquet and floral headpiece, called a haku in Hawaiian, as well as all of the lovely flower arrangements, props and decor was by Debbie Hemingway of Designs by Hemingway. 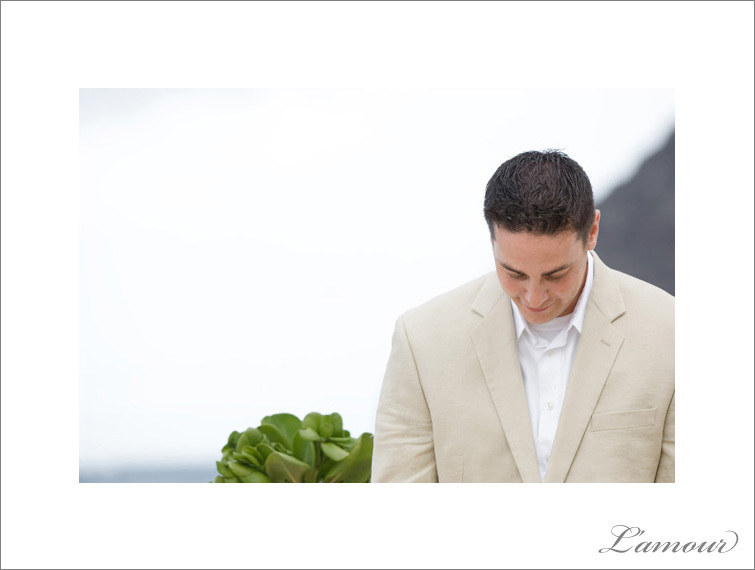 And of course, the most peaceful wedding venue on Oahu, the only place we would want to host our intimate ceremony, Bayer Estate. 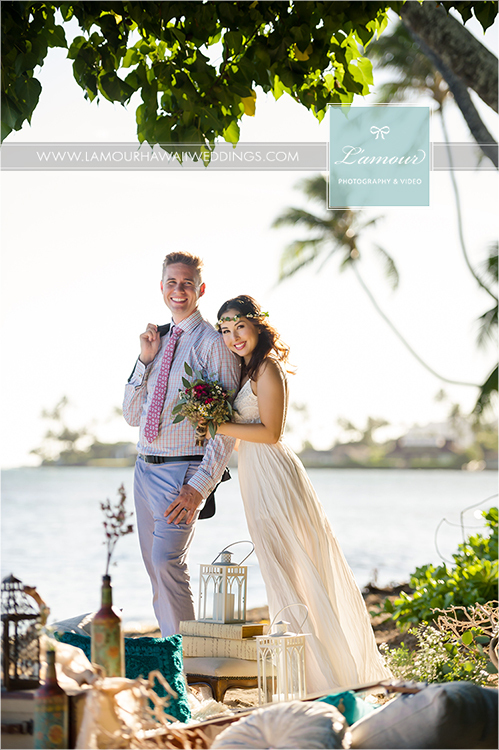 The simple yet whimsical backdrop of the wedding ceremony was designed using blue, teal and cream colored fabric strip ribbons which swayed in the wind as we renewed our vows. 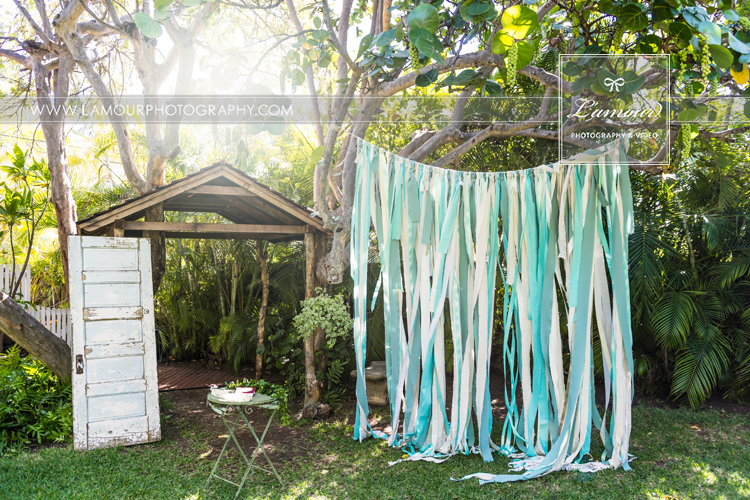 A vintage distressed blue and white painted door added a nice touch to the ceremony site. 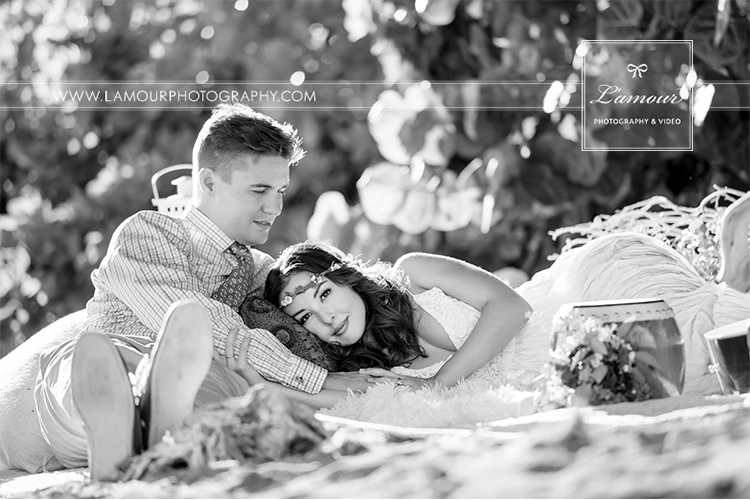 After our intimate ceremony, we headed to the beach in front of Bayer Estate to lounge and enjoy some champagne. 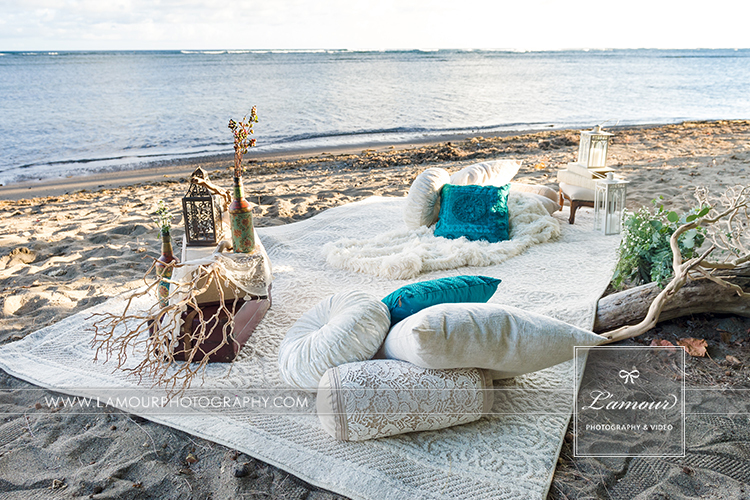 This cute scene is from Designs by Hemingway and featured multiple textures to create a luxurious yet, beachy feel. 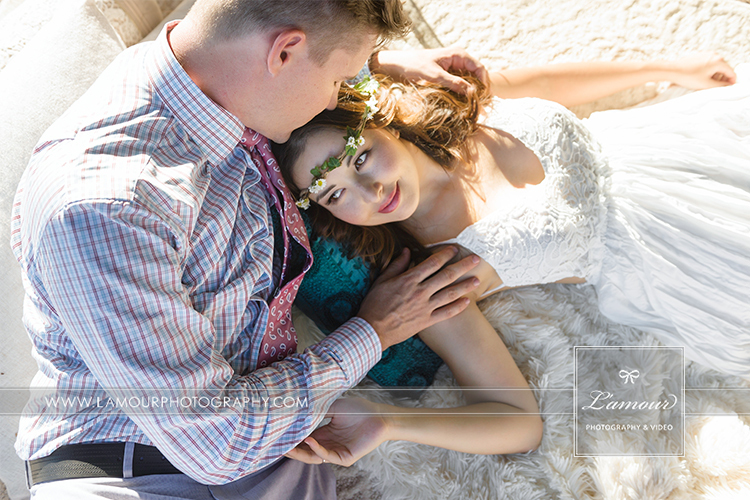 Myla and Tommy were such a great couple to work with. 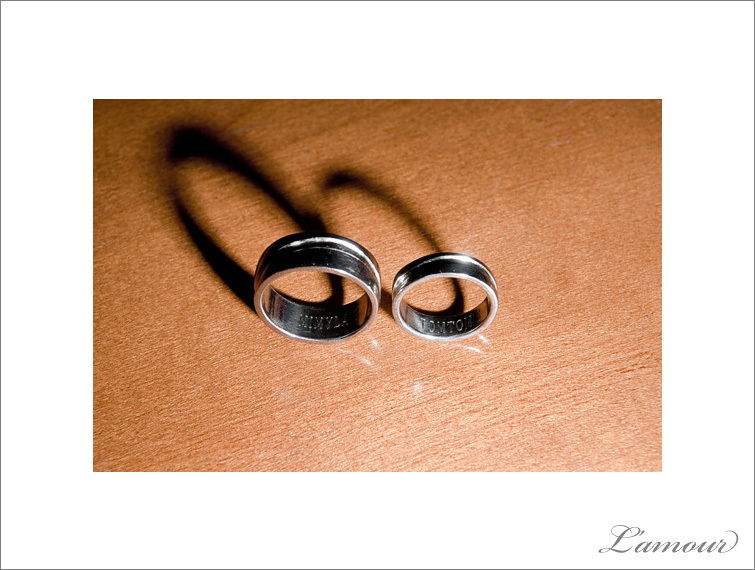 From the moment we met them, we were struck by how nice they were and how SO in love they were. 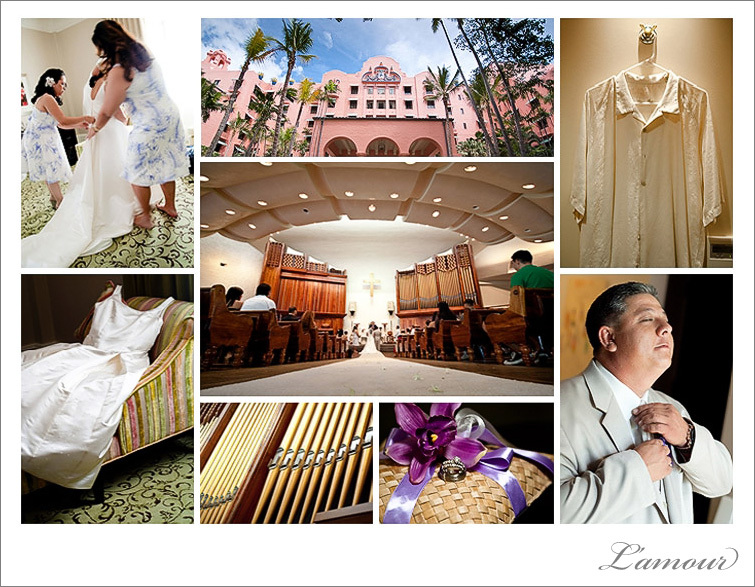 We started our day with the beautiful bride as she and her bridesmaids got their hair and makeup done by Beauty By May in their room at the Waikiki Marina Resort at the Illikai in Honolulu. 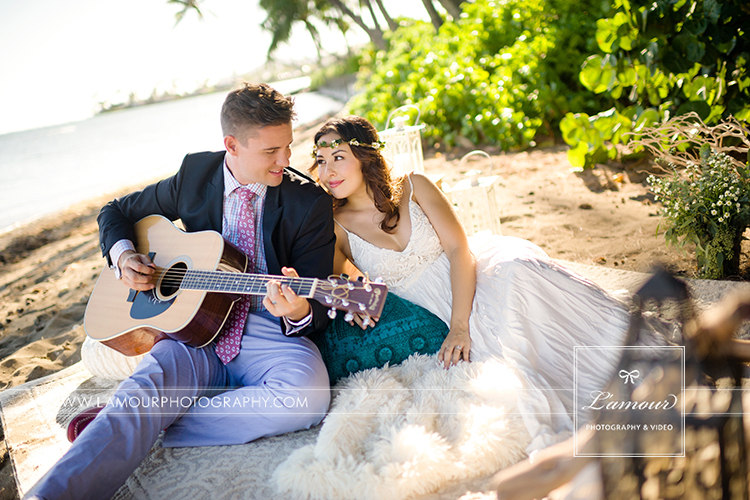 Myla wore an absolutely gorgeous ivory colored chiffon destination wedding dress by Maggie Sottero Destination with a corset back and an elegant one shouldered strap adorned with fabric flowers. 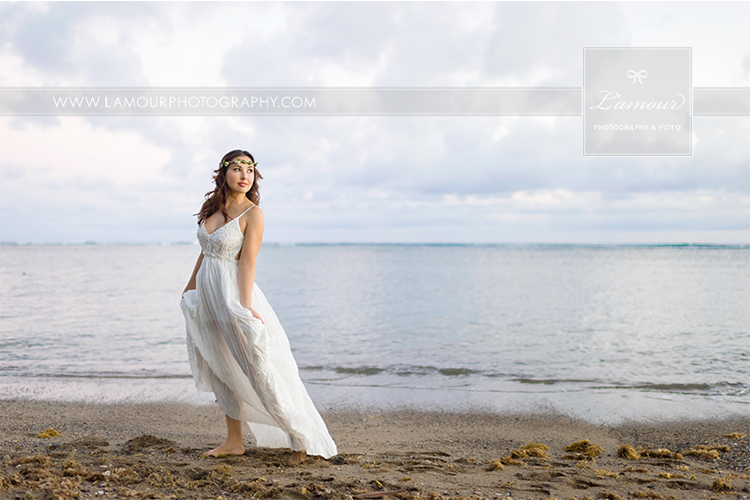 She honestly looked like she stepped straight out of a bridal magazine. 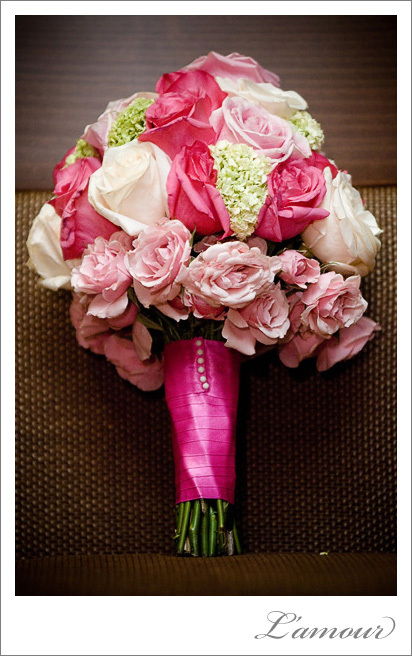 Her bridesmaid wore strapless fuchsia dresses. 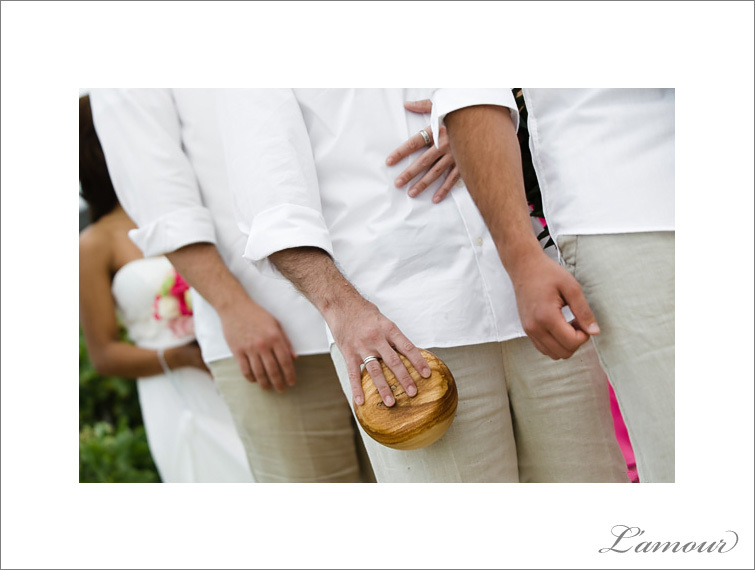 Tommy and his groomsmen wore simple white shirts and light khaki pants. 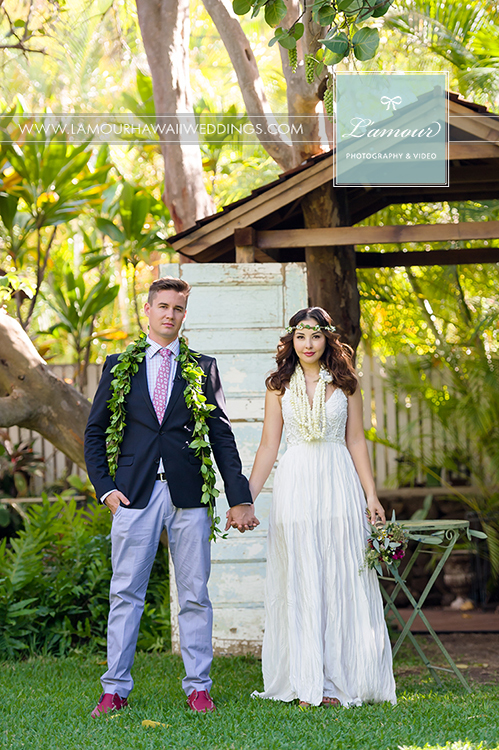 Tommy wore a traditional wedding lei of maile-style ti leaf and white orchids. 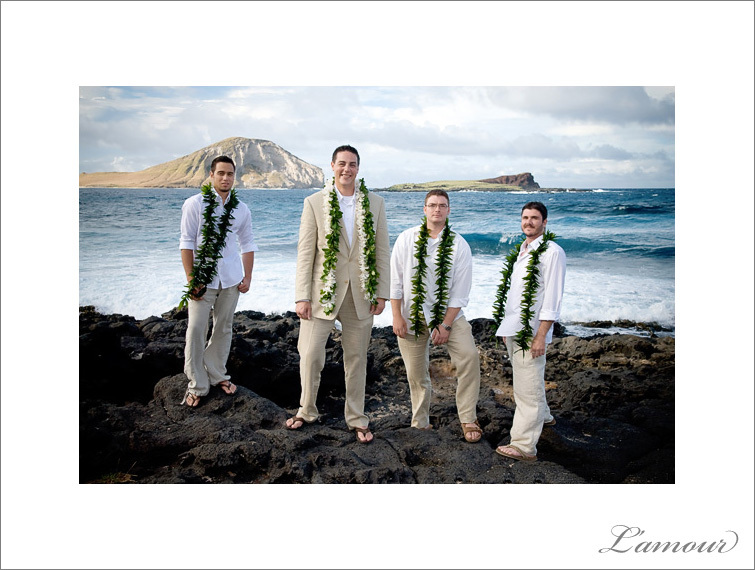 The group was whisked away in a stretched limo to Makapuu Beach for a private beach ceremony. 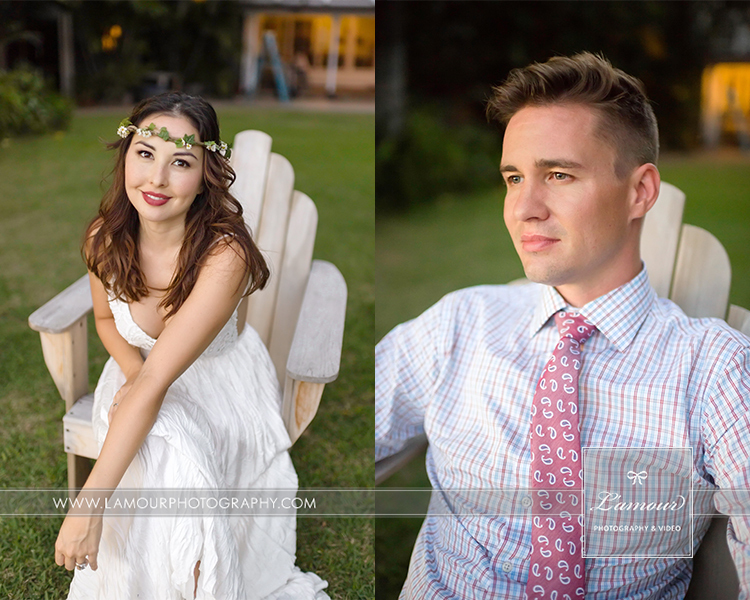 After a gorgeous beach wedding ceremony and a portrait session with the family, whole bridal party, we had a portrait session with just the bride and groom, just in time for the sun setting behind the mountains. 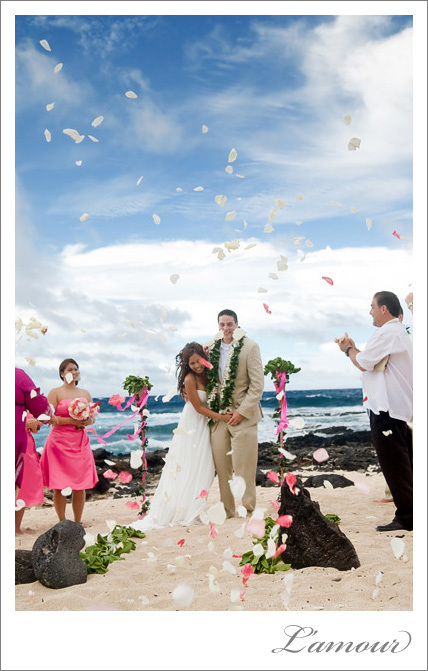 The bride and groom’s destination beach wedding ceremony was followed by a reception at the Top of Waikiki. 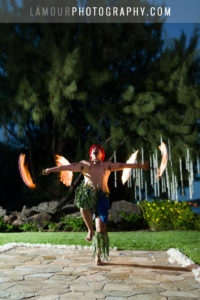 This restaurant is located on the 18th floor of the Waikiki Business Plaza in Honolulu. 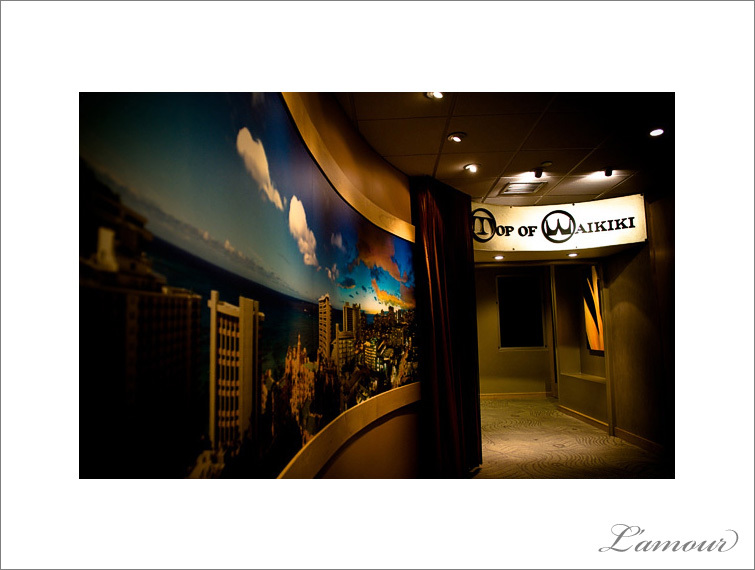 The Top of Waikiki restaurant makes a full 360 degree rotation every hour with stunning eagle-eye views of Waikiki Beach and Honolulu. 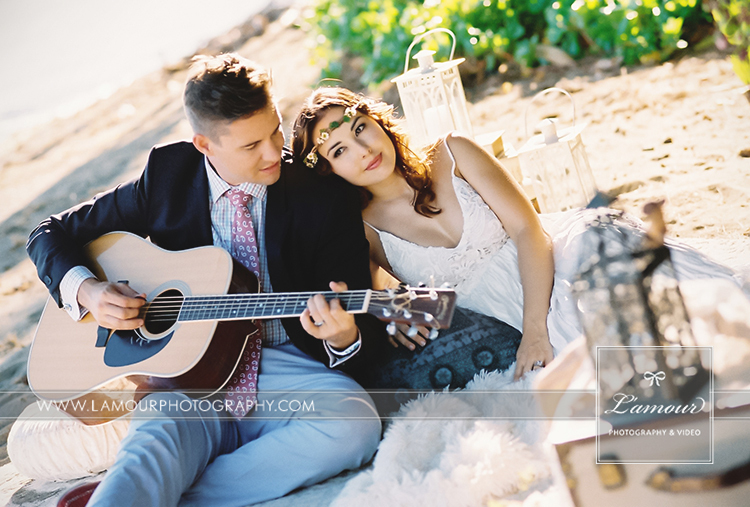 We had such a great time with this wedding. 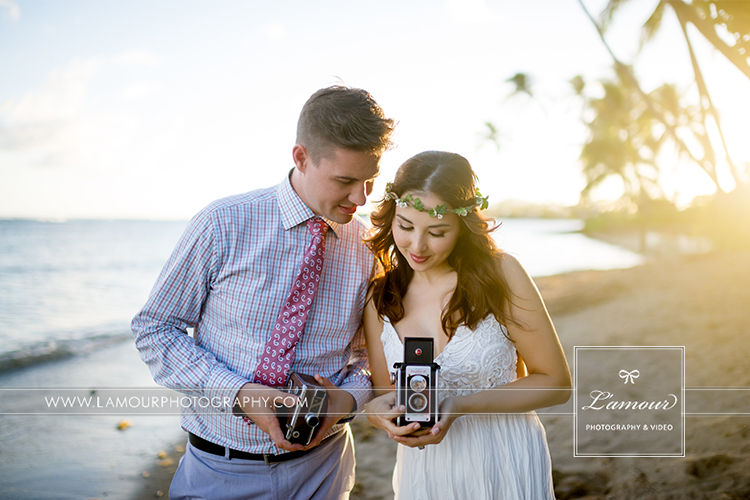 Thanks and congratulations to Myla and Tommy and thank you for having L’Amour Photography as your Hawaii Wedding Photographer! 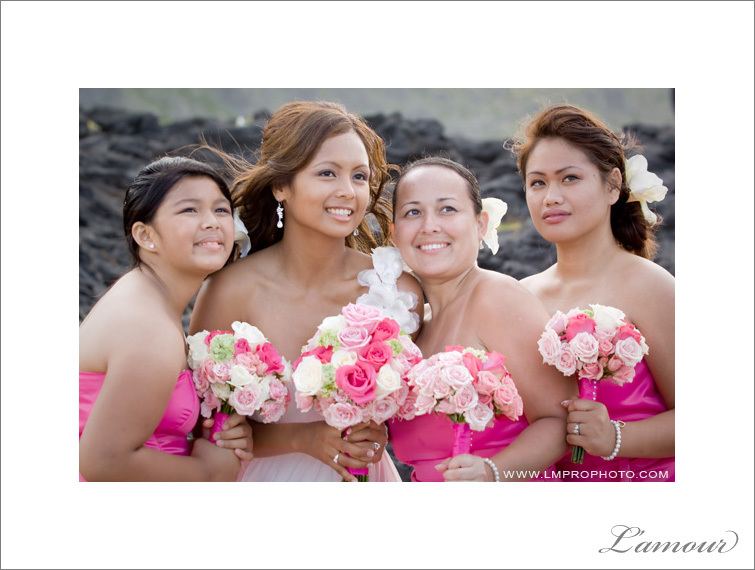 Lauwa’e enjoyed some good girl time with her bridesmaids while getting her hair and makeup done by Jaque Rojas. 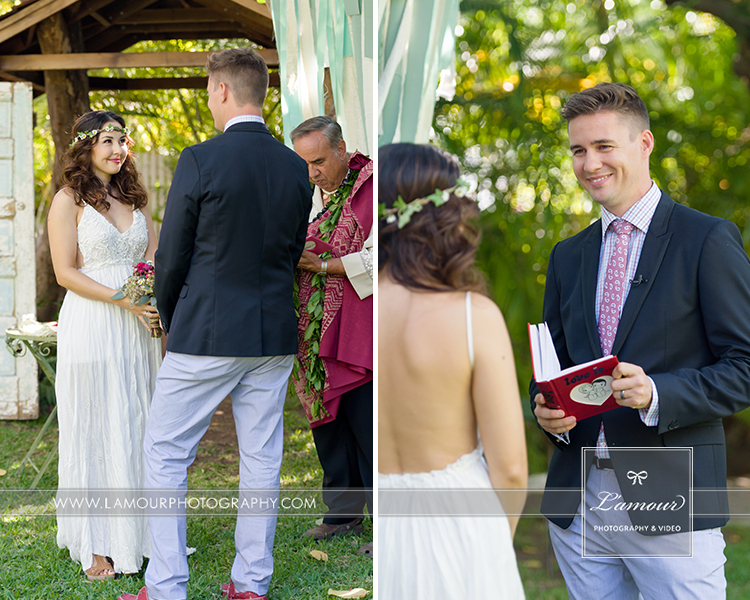 I hung out with the ladies as they got ready while Eric headed over to the wedding ceremony venue to capture the groom, Jay, and his brothers getting ready at The Bernice Puahi Bishop Memorial Chapel at Kamehameha School. 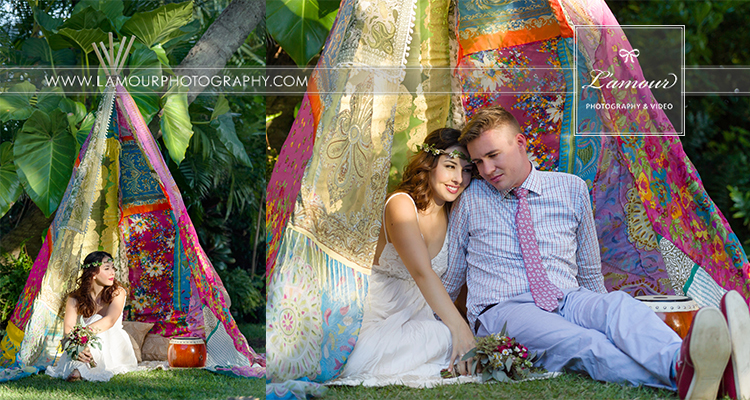 This was our first time shooting at this venue and we were instantly struck by its culture and beauty. 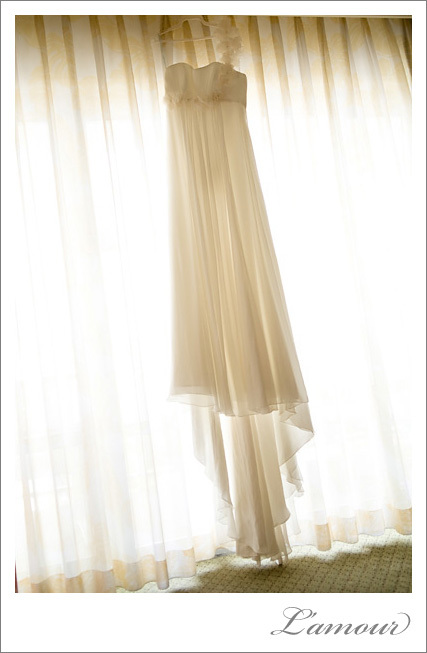 Eric and I broke from our “pre-wedding” diet (30 days to go!) 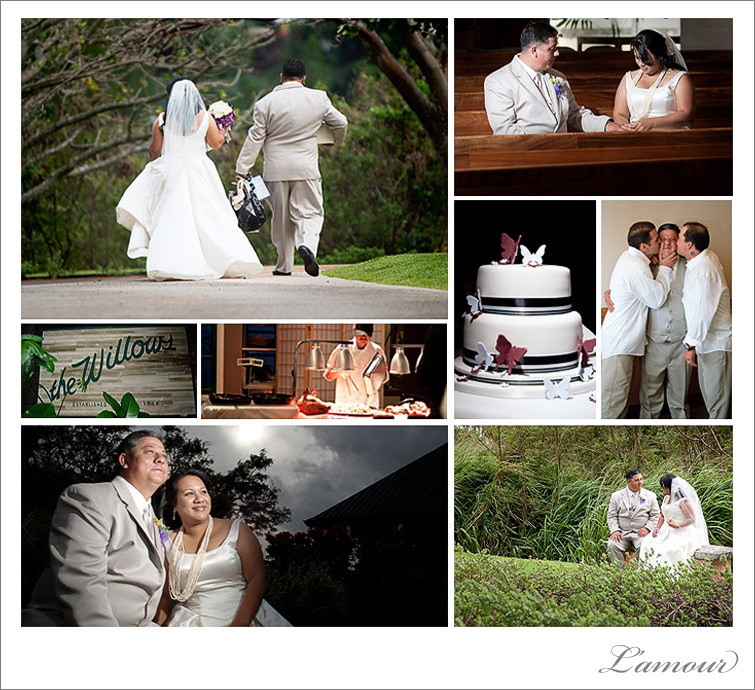 to try some of Lauwa’e and Jay’s wedding cake and oh my gosh it was definitely worth it. 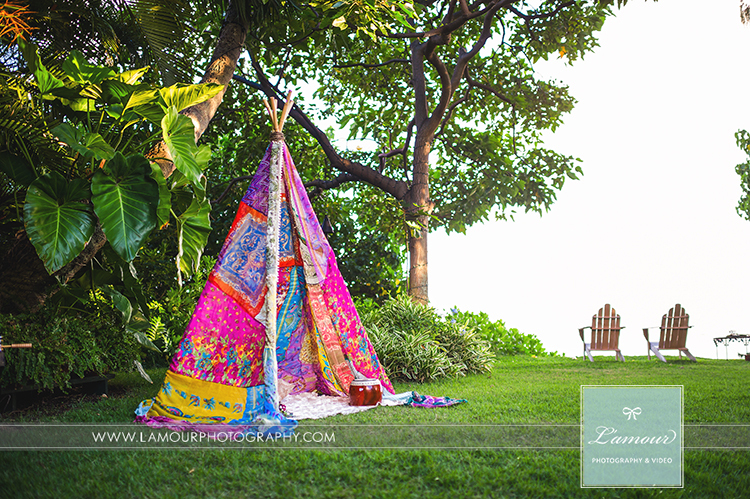 This cake was done by one of our favorite cake artists Sunshine’s Cake Creations. 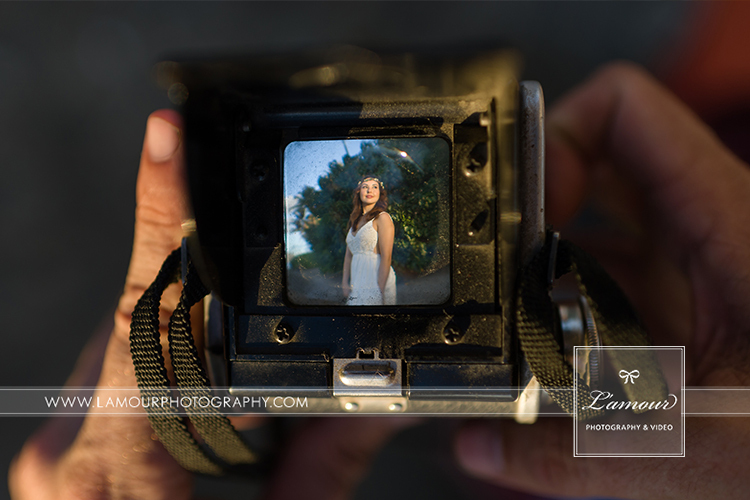 We never cease to be amazed each time we see and taste Vikki’s work. 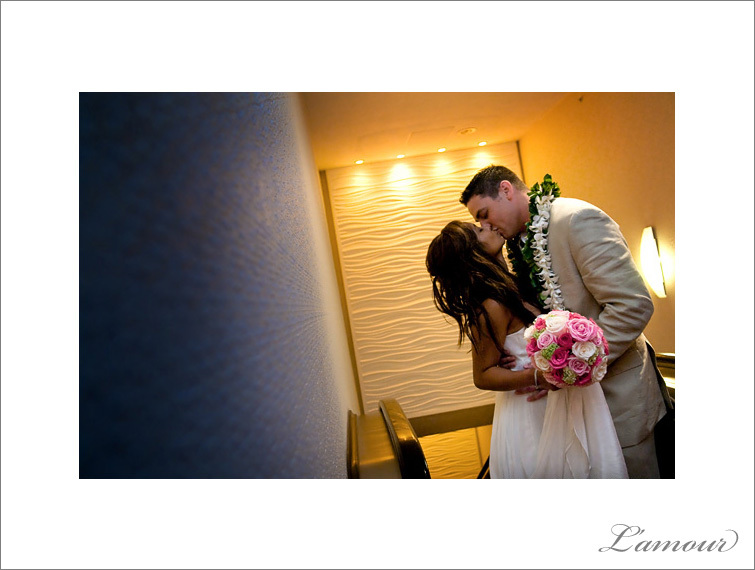 Best wishes to Lauwa’e and Jay. 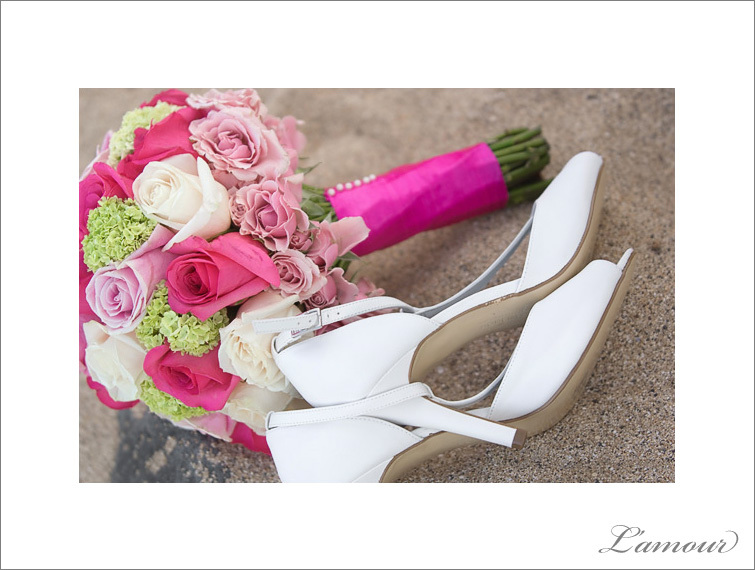 Thanks so much for allowing us to be part of your beautiful big day!